Acts 27v39 - 28v6 When it was day, they didn't recognize the land, but they noticed a certain bay with a beach, and they decided to try to drive the ship onto it. Casting off the anchors, they left them in the sea, at the same time untying the rudder ropes. Hoisting up the foresail to the wind, they made for the beach. But coming to a place where two seas met, they ran the vessel aground. The bow struck and remained immovable, but the stern began to break up by the violence of the waves. The soldiers' counsel was to kill the prisoners, so that none of them would swim out and escape. But the centurion, desiring to save Paul, stopped them from their purpose, and commanded that those who could swim should throw themselves overboard first to go toward the land; and the rest should follow, some on planks, and some on other things from the ship. So it happened that they all escaped safely to the land. When we had escaped, then they learned that the island was called Malta. The natives showed us uncommon kindness; for they kindled a fire, and received us all, because of the present rain, and because of the cold. But when Paul had gathered a bundle of sticks and laid them on the fire, a viper came out because of the heat, and fastened on his hand. When the natives saw the creature hanging from his hand, they said one to another, "No doubt this man is a murderer, whom, though he has escaped from the sea, yet Justice has not allowed to live." However he shook off the creature into the fire, and wasn't harmed. But they expected that he would have swollen or fallen down dead suddenly, but when they watched for a long time and saw nothing bad happen to him, they changed their minds, and said that he was a god. The snake on the beach. The local Maltese people were hospitable to them. Immediately, the Maltese people built a fire on the beach for the weary travellers. Paul had gathered some of the wood for the fire, and when he put the wood on the fire, a snake was driven out by the heat, and fastened itself onto his hand (Acts 28v3). At this point, because of their superstitions, the Maltese thought Paul was a murderer and trying to run from justice. Paul did not suffer however, and the Maltese changed their minds about Paul. He went from being a murderer, to 'a god' (Acts 28v6). God was glorified yet again through this event, and Paul no doubt would have been horrified at being called a 'god', just as he was at Lystra years before (Acts 14v11-18). This shows that God gives grace to the humble, and Paul was indeed a humble man. The healing of the sick. The other event we hear about is about Publius. Publius was the Maltese leader. He entertained the ship's company, and Paul healed Publius' father and the rest of the island came and were cured. Salvation by the grace of God was preached, and Paul was honoured in many ways. We are not told if any Maltese became believers at this point. After three months in Malta, they sailed on towards Italy. They landed at Puteoli and Paul stayed there a week with some fellow believers, who had come as far as forty miles to meet him Paul thanked God for them and was encouraged by God through them (Acts 27v24). God's had kept Paul safe, by His power to fulfil his promise to him about standing trial in Rome. Paul had experienced what he had long known to be true, that whatever happens in life, falls within the purpose of God. No storm, no shipwreck, no snake, no Sanhedrin, no riots, no threats could separate him from the love of God or stop God's purpose for him. Just because people accept an invitation, doesn't always mean they will listen. Paul found this out with the Roman Jews. They listened to him, and then rejected the gospel message. This is the last specific event recorded in Acts. We are left with the picture that preaching the Gospel is hard in a world that is unsympathetic to us. It is also the last instance of a Jewish rejection of Paul's ministry, and from now on he seems to concentrate only on the Gentiles. This is shown in the universal nature of the church today, whereas back in the time of Paul, it was primarily Jewish. It also confirms Jesus' principle that when the message is constantly rejected in one place, to take the message elsewhere (Matthew 10v14). The gospel moves on, seeking the lost wherever they may be found. 3. Mission while under arrest! For two years Paul was able to preach the gospel in Rome, and all this time he was under house arrest! There are 3 main features of his ministry during this time. a. He welcomed all who came to see him. His door was always open to all enquirers. If he could not go to them, then he would always welcome those who came to him. b. He consistently preached the kingdom of God and taught about Jesus. Paul's passion was Jesus, and his message of salvation was the saving grace of Jesus. Christ dominated Paul's life. Paul loved the Lord and constantly lifted Him up before people. c. Paul preached boldly and without hindrance. Even though Paul's hands were chained, his mouth remained open for Jesus Christ and his gospel. This sums up the book of Acts. Jesus cannot be contained. The gospel cannot be silenced. The salvation of sinners cannot be stopped. The work continues. Jesus told his disciples that they would be his witnesses 'in Jerusalem, and in all Judea and Samaria, and to the ends of the earth' (Acts 1v8), These words continue for us today as we go into our places of work, study, or our families to tell them of the saving love of Jesus, that his name is the only name given under heaven among men, by whom we will be saved. The book of Acts does not end with a final statement, but with a story that continues. It seems that God wanted Luke to end the book of Acts with an open and unfinished story. Why? 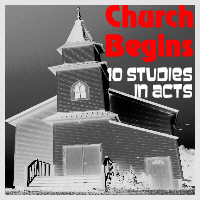 The book of Acts, then, is all about the continuing work of God in and through His people, the church. It is about the unfinished work of faithfulness: faithfulness to reach out (Acts 28v17-22), faithfulness to persevere when people will not listen (Acts 28v23-30), and faithfulness to proclaim Jesus (Acts 28v30,31). Our faith grabs hold of God's power, and this power strengthens our faith, and we are preserved; it places us within those walls, and sets our souls within the guard of the power of God, which is only left exposed by our own selfish pride and acting in our own strength. Faith is a humble, self-denying grace' making the Christian nothing in himself and everything in God - He and He alone should be our security. We who are believers, are the result of the work of the Holy Spirit in the church of the book of Acts. We are to be indebted to the work of Paul and the other Apostles. It would be their desire, for us to continue on the work they left. It would be their desire, to see us, living the gospel of truth in a world that is dying to know of the grace and love of its Saviour, Jesus Christ. We, as Christians in the 21st Century, are part of Acts Chapter 29. Will we be written as part of the story, or simply be placed on the side? That is the challenge for all of us who believe in Jesus. There is no neat, happy ending we all enjoy.